Rachio today announced that it has added HomeKit support to its Rachio 3 Smart Sprinkler Controller, allowing the device to work with Siri and other HomeKit accessories to control sprinklers. According to Rachio, its Smart Sprinkler Controller is the first sprinkler controller to offer HomeKit integration. The Rachio 3 Smart Sprinkler Controller works with the Home app or through the Rachio app, and connected sprinklers can be controlled from any iPhone, iPad, Apple Watch, HomePod, or Apple TV. With a HomePod or an Apple TV available for remote access, connected sprinklers can also be controlled when away from home. "We are excited to bring HomeKit support to Rachio customers," said Chris Klein, CEO and co-founder of Rachio. "HomeKit users already have a smart home, and now they can have a smart yard, too. Rachio consumers have been asking for HomeKit integration, and we are excited to deliver it to them with our new Rachio 3 Smart Sprinkler Controller." 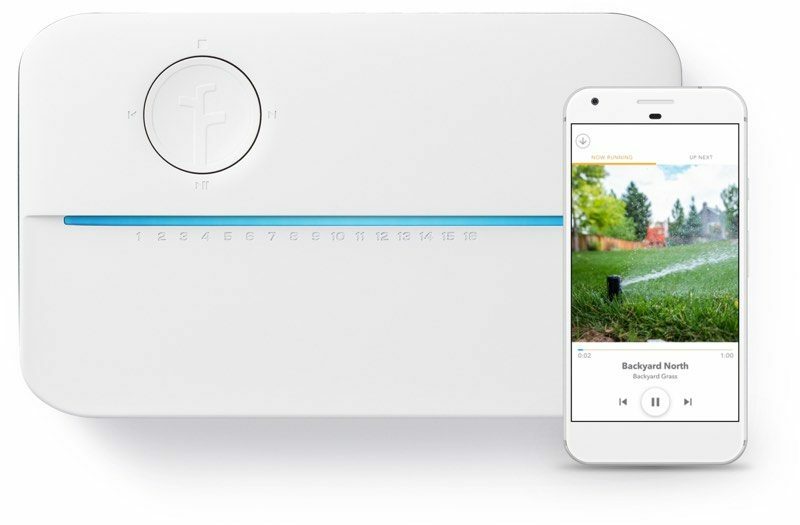 Rachio's Wi-Fi connected Smart Sprinkler Controller, priced at $229, offers up features that include easy installation, a Flow Meter for monitoring water usage, and Hyperlocal Weather Intelligence for turning on sprinklers only in appropriate weather. The Rachio 3 Smart Sprinkler Controller can be purchased from the Rachio website. Live in Ohio, had a Gen 3 all season, saved me approximately $125 on watering this season so far. Since I pre-ordered with the FlowMeter pretty early on, I got a great deal. Either way, having had irrigation controllers for many years, this is the first one I've had that actually saves me money and my yard/flowers don't suffer. Related to the article, I have it set up with Alexa and never use it, doubt I would with HomeKit either. I have a Gen 1, if its software related, whey do I have to update hardware? I still haven't received an answer from them either, on Saturday morning I came out at 8am to find my last zone had been running for 4 hours! To add insult to injury, the zone was running in the rain. The history shows the rain sensor shut off the last zone 2 minutes into its 4 minute run, but they did not shut off, instead it stayed on. Likely negating any water savings the rain sensor has EVER had. I know my gen 2 isn’t covered. But HomeKit isn’t that useful so for me so far so eghhhhh. Gen two is great and has been working great for me. I got it for less than $130 on Amazon. HomeKit isn’t that useful. I usually set it and forget it with my setup. You can always use a google home and it’s cheaper. The Rachio 3 Smart Sprinkler Controller works with the Home app or through the Rachio app, and connected sprinklers can be controlled from any iPhone, iPad, Apple Watch, HomePod, or Apple TV. With a HomePod or an Apple TV available for remote access, connected sprinklers can also be controlled when away from home.Rachio's Wi-Fi connected Smart Sprinkler Controller, priced at $229 ('https://www.rachio.com/rachio-3/'), offers up features that include easy installation, a Flow Meter for monitoring water usage, and Hyperlocal Weather Intelligence for turning on sprinklers only in appropriate weather. The Rachio 3 Smart Sprinkler Controller can be purchased from the Rachio website ('https://www.rachio.com/rachio-3/'). I've had all three generations and they have paid for themselves easily. The savings are definitely observable and my 2 acre lawn looks great always. I really appreciate the technology and updates. Rachio, in my book, is the best controller I've ever used and researched. They do a great job supporting customers and keeping things updated. Agree. Also I have mine set to skip watering when it’s rain, or if the wind is more than 17mph. Nothing more annoying than watering in the rain. Pretty sure you can, I use someone close that has some sort of weather station and shares with WU in addition to my rain sensor. Rachio has an AMAZING forum, you can probably check for sure on that forum. I think Rachio has the potential to save water on any size irrigation system. Our small property just has 4 zones. I have a wireless Davis Vantage Pro2 weather system (with a rain meter)and I have my own “station” via Weather Underground. Anyone know if I can tie into that. I.e Rain meter senses water, turns off irrigation. Thanks! How does this work? Do you need a full irrigation system for this to be useful? You better believe it buddy, I already have automated a doorbell with HomeKit via an Aqara button. I'm totally going to turn this loose on door to door salespeople!! It's good till Oct 7 apparently. You’re move Orbit. Don’t know what’s taking you so long considering you announced back in January. this is exactly what I was waiting for. Will buy next spring.